Project Management: Are You Biting Off More Than You Can Chew? You have a grand idea, product, service, event, or project to pull off. Everyone is excited. 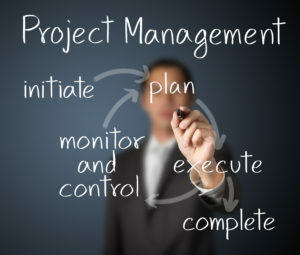 You have a project to manage. But there’s a problem. Project management has always created problems for you. How can you assure you are not biting off more than you can chew? How do you set yourself up for success by making a project manageable to begin with? Tent Pole Project: This is the big project. It usually has a firm deadline or drop dead date associated with it. There is some sort of clear consequence tied to not meeting this date. The date is firm and is usually controlled by something outside of yourself (even if that something is just a pressure to get it done). Sub Project: These are time sensitive projects that exist within the tent pole project. They might be a little more movable in deadline than the tent pole project itself. However, too much movement on a sub project and the outcome of the tent pole project can be put at risk. Example: You are attending an event, but you need to reorder your business cards because you are out. Milestone: Tent Pole Projects can be milestones if they are under a larger tent. For example, I have a client who is speaking at a TedX Event. This event is one project inside a larger tent pole of a direct to consumer toy industry product launch. The TedX Event is a milestone for her. The development of her web site as well as the manufacturing of the product are also milestones until this major tent pole project of the direct to consumer campaign. Then, you need to get real. Where leaders get hung up on this in the perception of time and what can be realistically achieved in a time frame. This is where it helps to have a clear handle on start dates, completion dates, project types, costs, and responsible parties. Business will do its thing and interfere with your projects. Knowing where you are in your timeline will help you manage expectations and set yourself up for success as your project moves along. Do you need project clarity? Do you feel stuck? We may be a fit for you. Depending on the size of your project, one consulting hour with us could save you millions. Contact us to receive a 30 minute complimentary consultation to see if we can help.